NOTES: Includes photo etch, cloth and metal parts. One of the many things that Platz-Hobby provides are photo etch and upgrade parts. This particular upgrade set is for their new BMW M6 GT3 that is being previewed today. 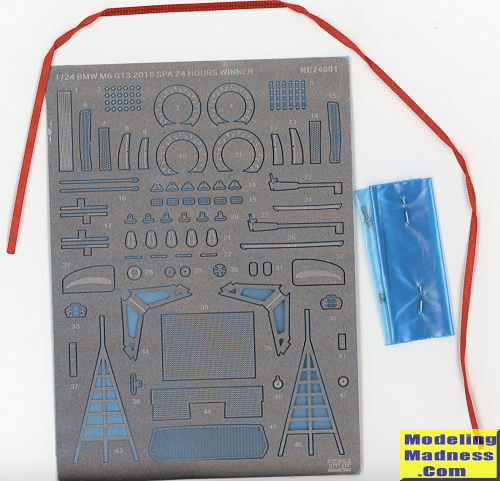 The set consists of three decal sheets, a fairly good size photo etch set, some small metal bits and a section of cloth. Decals provided are carbon fiber and will be used for much of the car's pan as well as areas around the windows and on the bodywork. There are over 50 of these so you can see how extensive this set actually is. The section of cloth is for making a seat harness, while the small bits are for a radio antenna and an air pressure or coolant connection on the top of the fender. Photo etch covers a variety of areas. There are screens for the intake and area behind the front fenders, brake discs, windscreen wiper, interior netting, the harness buckles, wing supports as well as a variety of smaller items like hood fasteners. The set comes with a comprehensive set of instructions on placing the decals and bending and attaching all the photo etch bits. A nice thing about the p.e. is that there are no little attaching nubs to cut. All the parts are held in place by adhesive backing on the sheet. One simply peels them off and attaches them. If there was a downside it is that everything is in Japanese, but those of us who have reached the level to use a set like this should have no difficulty. Thanks to www.platz-hobby.com for the review set. For more info go here.